Looking for the perfect Birthday Cloth Diaper? Win it! 9/23/16 FYSF, Win a Boy or Girl Imagine Baby Birthday Diaper! 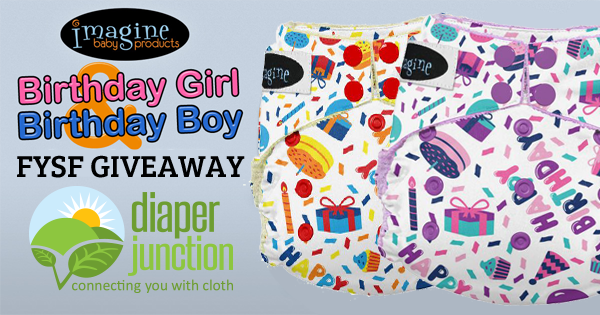 WIN a Boy or Girl Birthday Diaper from Imagine Baby! This week we're excited to have an official Feed Your Stash Friday sponsor, Imagine Baby! They're celebrating the release of their NEW Birthday themed cloth diapers by providing us TWO to give away! Both the Boy and Girl Imagine Baby Birthday themed diapers and covers will be available for purchase on September 27th. If you like to be the first to know when new products stock then we recommend you become a member of our Diaper Junkies Facebook Group where we post sales, updates, giveaways and more. Our Rafflecopter will ask you to specify which Bamboo AIO Diaper you'd like if you win, Boy or Girl themed. When the contest ends we will choose two lucky winners based on their preferences. To shop our in stock selection of Imagine Baby cloth diapers, accessories and baby gear please click HERE. I'd love a boy print. So cute!!!!???? I think the boy print looks VERY gender neutral. I would choose it for a girl! I would love to have Birthday boy print..
We would love the girl print.